Do you have questions that we can help answer? This Frequently Asked Questions Section will expand to include answers to many commonly asked questions. If you have a question that is not answered here, simply email us and we will answer you directly. What is the official name of the Battleship? The official name of the ship is Battleship New Jersey. Many crew that served on her referred to her as the “Big J”. Other nicknames include “BB 62” (for “Battleship # 62”) and “Black Dragon”. Where is the Battleship New Jersey located? The Battleship New Jersey is located on the Camden Waterfront in New Jersey near the Adventure Aquarium and the BB&T Pavilion. The Camden Waterfront is directly across the Delaware River from Penn’s Landing Philadelphia. Can we tour the Battleship? Absolutely! Even guests with physical limitations will have access to the Main Deck and Wardroom. 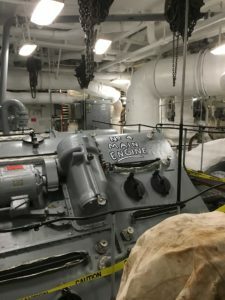 Tours cover many areas, including the Bridge, the crew’s mess, the communication’s room and the big 16” guns. 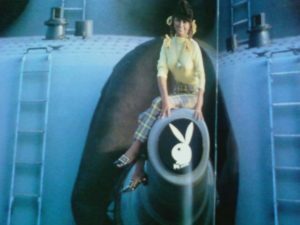 Climb inside the massive 16 inch gun turret. Enter the Combat Engagement Center where you’ll see a simulated launch of a tomahawk missile. Exhibits include “New Jerseyans on the Big J”, “A Sailor’s Life”, “Keepers of the Sea” and more. How do we get around for a tour on the ship? The Fire Power Tour is a self-guided tour. Guests will simply follow a colored line on the decks. 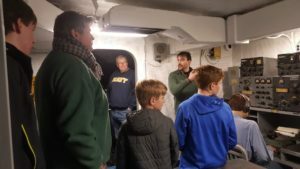 The Turret II Tour is an interactive guided tour focusing on the operation of the gigantic 16″ guns. Do you ever rent out parts of the ship for private events? The ship is available for both corporate and social events. 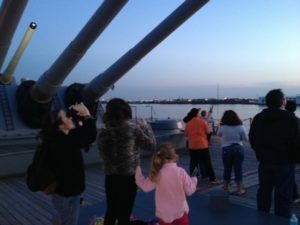 From board meetings to Bar Mitzvahs, the Battleship New Jersey makes a unique venue for your special event. For more information call our events department at 856-966-1652 x144. Can we support the Battleship New Jersey somehow? Yes. You can support the Battleship by becoming a member, a volunteer or by donating. For more information on donating time or money, please call the Battleship offices at 856-966-1652 x127.